WP Broadbean vs WP Job Manager Broadbean Add-on, which is the best? We have integrated many sites with both Broadbean and LogicMelon here at Highrise Digital. For those not aware, these are multi-job posting services which allow users to write a job in one place and then send this out to multiple channels (think popular job boards such as Indeed and Monster jobs). Our integrations enable one of these channels to be your WordPress website. In addition to that, these services allow applications made via any of the channels to be centrally managed. The benefit is that jobs can be published and candidates managed across multiple channels in one place. Although we have created a number of bespoke offerings for clients, we have 2 popular plugins that customers can use to integrate these services with their WordPress website. One is open source and the other is an add-on plugin for the popular WP Job Manager plugin. Both work slightly differently and depending on your needs will depend on which is best for you. Lets take a look at each now outlining the features, advantages and disadvantages of each. 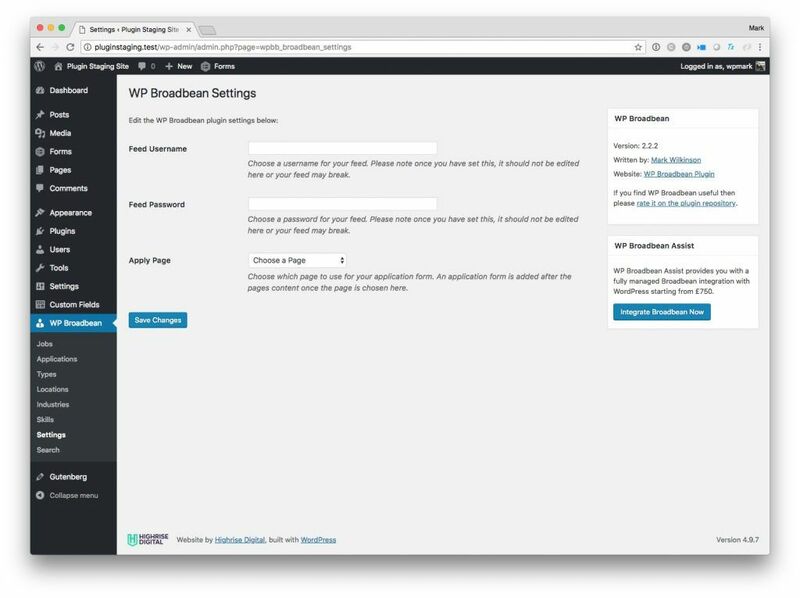 The WP Broadbean plugin settings page where the plugin is setup for use. Create custom groupings or categories (called taxonomies in WordPress) for grouping jobs together by industry, location, skill and job type. Each grouping gets its own listing page, listing jobs from that group e.g. all jobs in a specific location. Supports the add, edit and delete methods which means that jobs can be added, edited or deleted all from the job post service rather than the WordPress admin. Cannot take advantage of lots of other add-ons, such as those available for the WP Job Manager plugin. This plugin is best to choose when you only need a simple job board to start off with. It is also a good choice if you have a developer that can set this up for you and also make any customisations that you require. 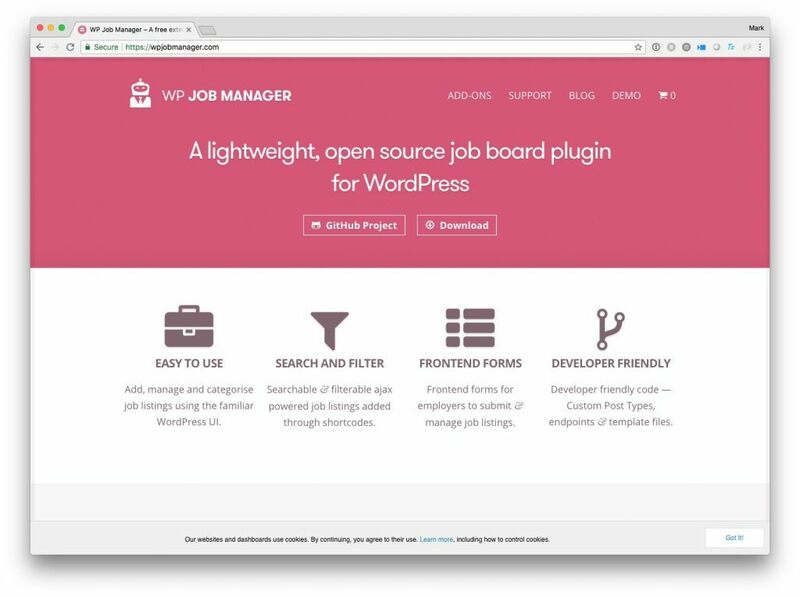 The WP Job Manager is a popular job board plugin for WordPress. Creates an endpoint for the job posting service (Broadbean or LogicMelon for example) to send XML date to about a job. The plugin is ideal for non-developers as it uses the functionality of the main WP Job Manager plugin. Therefore if you are looking for a good out-of-the-box solution where you may want to make minor changes this is the best solution. It also makes sense if you think you will need functionality provided by the many add-ons for the WP Job Manager plugin. The WP Job Manager Broadbean add-on plugin is a licensed product where all licenses last for 12 months. This gives you access to plugin updates and support. All prices are excluding VAT. Both plugins offer similar functionality. The WP Broadbean plugin is more developer focused and does require some expertise and development knowledge to setup and customise, however it is very flexible to use in that way. The WP Job Manager add-on is more suited for none developers as it uses the WP Job Manager plugin to handle these things for you. If you have any questions about either plugin or you would like us to integrate Broadbean or LogicMelon into your WordPress website then why not get in touch today.